OH, Jeez...how do you soft-release a Mourning Dove ???? Yes. My GF found a little sweetheart on the sidewalk yesterday. Limping. She could fly and she could hobble very well, but she couldn't lift more than 4' off the ground and clearly was not in her element where anything around her was very recognizable. We figure she fell out of her nest. I know Mourning Doves fledge fast, about what ?...14-17 days if I recall. But my guess is she was still a few days shy of leaving the nest. I have her, in a cage on warmth and have checked out the leg. There is no obvious break. Could be a fracture or just a sprain. She is on Cipro and Medacam..the former to prevent bone infection, the latter just for comfort. She eats some very small seed (finch mix) and I supplement with Kaytee formula and Pedialyte. Seems alert, tends to stay put most of time...want's NOTHING to do with ME ! Now...how does one soft-release a young Dove ? It's not like I can throw food on the grass and have all the Mourning Doves come to my feet...they are (as y'alll know) more cautious than Feral Pigeons. Gosh...I don't know if you can find a wildlife rehabber down there that that you trust and one that has other young doves to be released, but once she is acting ok...the perfect situation would be for her to spend some time with some others, in an outside aviary and released with them when it's time. 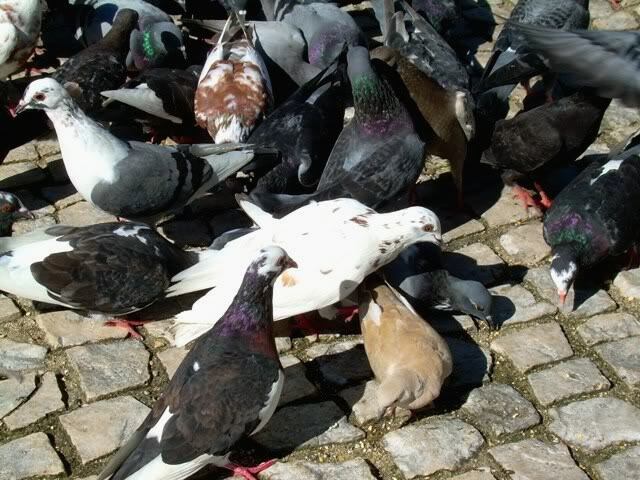 We don't have mourning doves over here, but I have seen a Eurasian collared dove soft-released into a flock of feral pigeons. She went round foraging with them, and eventually returned to her own kind -- who lived nearby but wouldn't come near people. Subject: Re: OH, Jeez...how do you soft-release a Mourning Dove ??? ?